The FamilySearch.org website offers FREE access to their database - MASSACHUSETTS, DEATHS, 1841-1915. There are 1,520 people in the database who have listed Greece as their place of birth. You will have FREE access to the death certificate images. The collection consists of an index and images of Massachusetts statewide death registers and certificates for the years 1841 to 1915. When deaths were recorded on register forms, the second page of the form is on the next image. The death registers and certificates are in numbered volumes arranged by year then by individual town. Starting in 1841, the state required that a copy of each death recorded in a town or city be sent to the Secretary of the Commonwealth. Since 1896, the Registry of Vital Records and Statistics has been the repository for the copies. Population coverage is near 100% for later years. Coverage is not as complete for some earlier years. Deaths were recorded to serve public health needs. They were also used to probate wills and administer the deceased individual’s estate. The information is generally reliable for the place and date of death of the deceased. Other information will only be as reliable as the informant’s knowledge or memory. The earlier records were recorded by hand in a register style format. 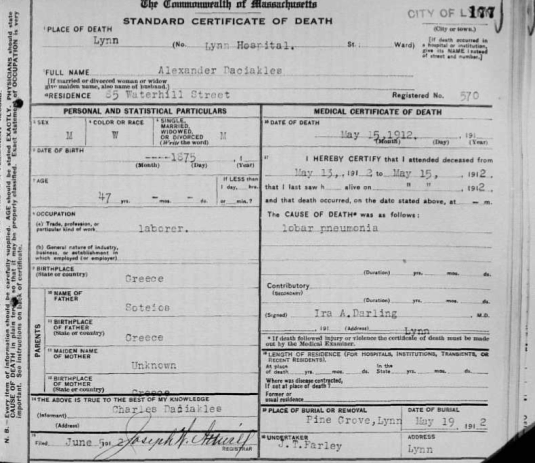 In the early 1900’s, individual death certificates came into use.